Bryan Hulbert - TULSA, Okla. (January 15, 2019) - Winning in preliminary night competition for the fifth time at the Lucas Oil Chili Bowl Nationals presented by General Tire, California's Kyle Larson grabbed the lead on Lap 6 of Tuesday's Warren CAT Qualifying Night A-Feature then went unchallenged to punch his ticket into his eighth 55 Lap championship event. Chasing Zach Daum, the first five laps, Larson tested top and bottom on the Tulsa Expo Raceway before rolling by the Illinois racer on the cushion exiting turn two. Moving top shelf in pursuit of the McDonalds No. 01, Daum as unable to keep pace as Larson reeled in slower traffic. "That might be the second time I got Zach (Daum) in a prelim night," commented Larson. "They work the track before the feature so as the leader you just run the bottom until you hear somebody or see somebody. I was just able to get around him....It was just nice to get to the lead there and run a good pace, but I was hoping I would get a caution before I got close to traffic." Working backmarkers by Lap 9, Larson's advantage changed very little before the caution lights lit up working Lap 16 a Kyle Jones spun his No. 7u almost directly in front of Kyle Larson. Able to avoid, Larson brought the field to speed with the lap count adjusted to the last fully completed lap. Battling for second on the restart, Zach Daum came under fire from the Lonestar Speedway No. 15h of Sam Hafertepe, Jr. Briefly exchanging the runner-up spot, the Toyota No. 5d reclaimed the position, but the brief battle was enough to allow Kyle Larson room to run away. Running into traffic once more, the caution flag flew again with five laps to run as Larry Wight's night ended with a cloud of smoke billowing out from beneath the bonnet of the No. 99. Taking third prior to the caution, Jonathan Beason, from tenth, worked all over the back bumper of Zach Daum on the restart as the field continued to chase Larson. Smooth on the cushion, Larson crossed with 1.087 seconds of breathing room. Able to hold off Beason the final five laps, Zach Daum made his seventh championship event. Racing in and out of the top five most of the A-Feature, Michael Faccinto grabbed fourth with Sam Hafertepe, Jr. finishing fifth. Fourth the first 16 laps, Tyler Courtney's run dimmed in the closing laps to sixth. Dillon Welch in seventh was trailed by Chili Bowl Rookie, Jesse Colwell. Ninth went to Alex Bowman with Tanner Berryhill making up the top ten. 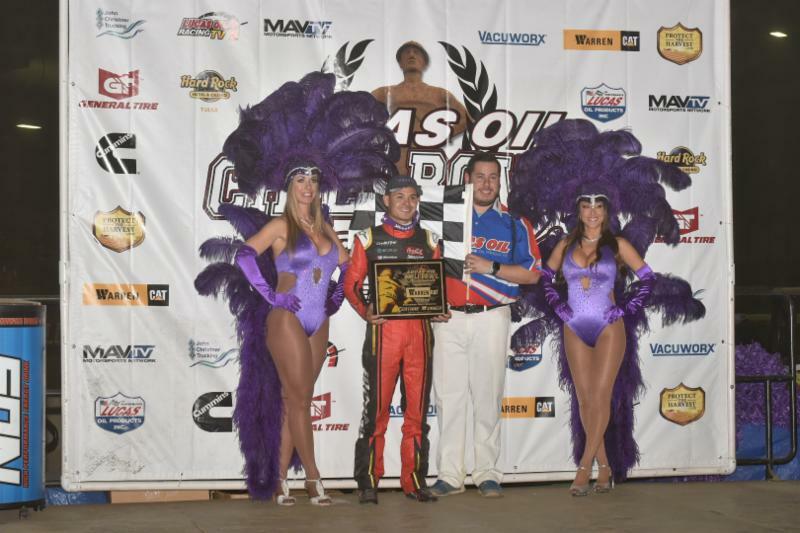 Going 20 laps in the 11th annual Vacuworx Invitational Race of Champions, Tanner Thorson led nonstop for his second victory. Bringing a brand-new Clyde Lamar owned entry, the famed No. 3c from California was untouchable. Outrunning Kyle Larson to the win, the final podium step went to the hard-charging Christopher Bell, who came up 12 positions. Ryan Bernal and J.J. Yeley completed the top-five. Tuesday's Warren CAT Qualifying Night at the 33rd annual Lucas Oil Chili Bowl Nationals presented by General Tire saw 69 drivers drawing in to bring the event total so far to 132 drivers checking in. Through the second night of action, the Chili Bowl Flip Count is up to 15. All drivers have been able to walk away. The 33rd Lucas Oil Chili Bowl Nationals presented by General Tire continues Wednesday, January 16, 2019, with Hard Rock Hotel and Casino, Tulsa Qualifying Night. The River Spirit Expo Center will open at 9:00 A.M. with Pit Pass sales starting at 11:00 A.M. Hot Laps will get underway at 4:00 P.M. with racing at 5:00 P.M. (CT). A field of 74 drivers is expected to take to the track.